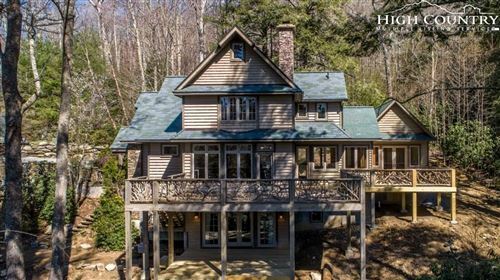 Fabulous mountain retreat located at the top of Mill Ridge/ Sleepy Hollow with seasonal views of Grandfather Mountain. This incredibly convenient Mill Ridge location is just a short drive to Banner Elk, Boone, and Blowing Rock. This spacious 5BR/3.5BA home has been incredibly maintained and renovated over the years. One will find main level living with an open great room with updated kitchen, wood floors, stone fireplace, picture windows, and access to the oversized semi-wrap around deck. On one side of the great room, you will find the private master suite, and on the other, you will find 2 spacious bedrooms and full bath. Downstairs you will find a wonderful second living space with wet bar, den area, and stone fireplace; two bedrooms, a remodeled full bath, and unfinished space serving as a workshop and storage. Up and down you will find oversized connected decking spanning the width of the house with wonderful views. Outside you will find a beautiful flower garden, circular drive allowing for extra parking in addition to the wonderful covered parking area. This turnkey property is perfect for seasonal or full time living. Furnished with few exceptions.